Electric power quality, or what is termed “power quality”, determines the efficiency of an electrical network and the ability for electrical devices to use the electrical energy being supplied without it being subjected to detrimental forces. Power quality is determined by the waveform shape, the voltage and frequency. It is the compatibility and interaction between the power supplied and the load connected. With the varied and increasing demands from the user, whether industrial or residential, many introduced electrical loads cause disturbances on the power grid and form frequent deviations from the ideal power quality mentioned above. 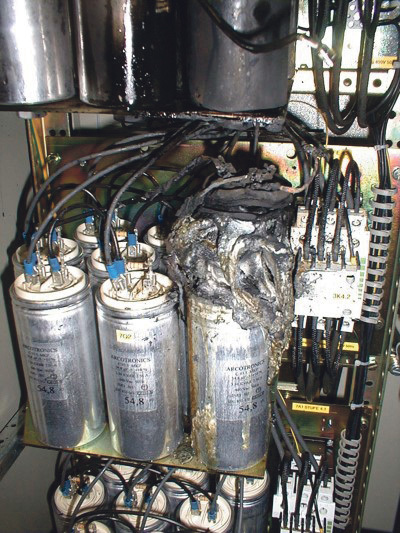 Poor power quality will cause equipment to underperform, breakdown and can cause significant damage throughout the end users network. 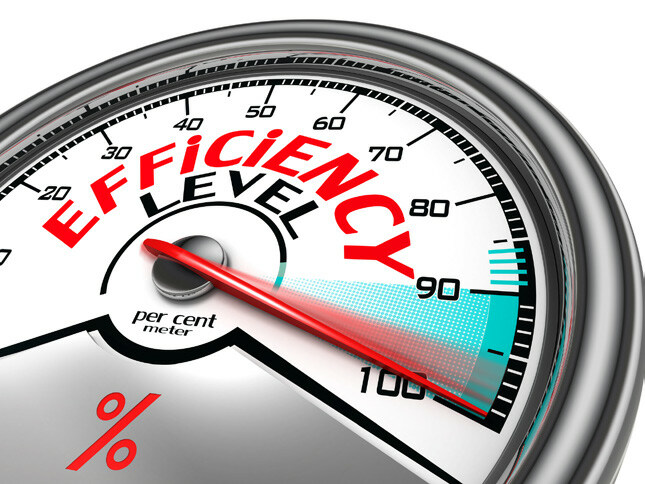 Assessing and understanding the quality of your power will save electrical costs and reduce breakdown times. 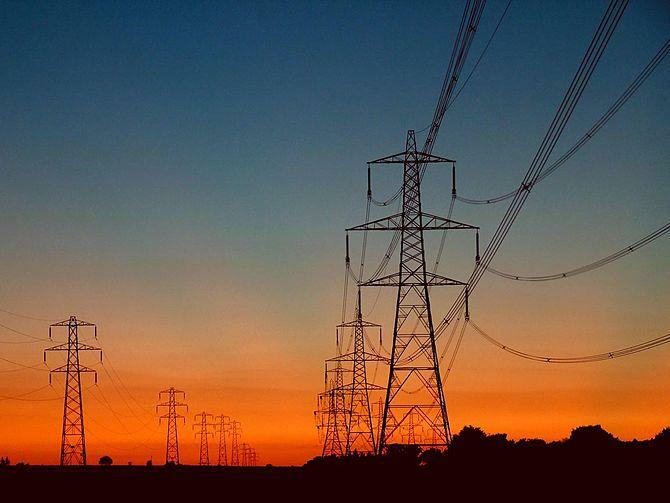 Power stations generate AC electrical power and is transmitted via a network of grids, which include overhead lines, and transformers, eventually this electrical power arrives at the meter of the electrical user. The electricity then moves through the wiring system of the end user until it reaches the load. 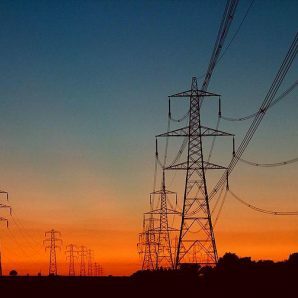 The complexity of the system to move electrical power from the point of production to the point of consumption combined with variations in weather, generation, demand, transmission material quality, and other factors, provide many opportunities for the quality of the supply to be compromised. The ideal situation is to have your power supply as smooth as possible. However, the introduction of alternate energy supplies, such as wind and solar energy is causing issues with the quality of the power supplied to premises. Added to this, the type of load connected by the consumer can cause Power Factor problems and Harmonic problems combining to cause poor power quality. 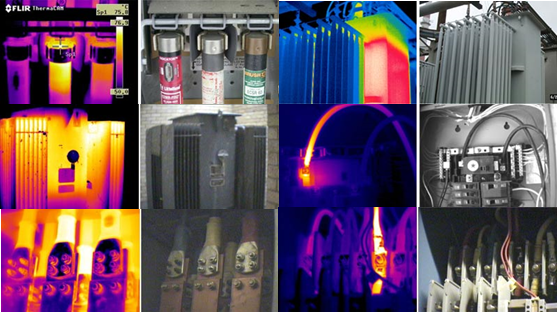 Variations in the peak or RMS voltage are both important to different types of equipment. A “swell” occurs when the RMS voltage exceeds the nominal voltage. A “dip” is the opposite situation: the RMS voltage is below the nominal voltage. Random or repetitive variations in the RMS voltage can produce a phenomenon known as “flicker” in lighting equipment. Abrupt, very brief increases in voltage are called “spikes” or “surges”, generally caused by large inductive loads being turned off, or more severely by lightning. “Under voltage” occurs when the nominal voltage drops. “Overvoltage” occurs when the nominal voltage rises. Variations in the frequency are important to know as it effects the performance of the installation. Nonzero low-frequency impedance occurs when a load draws more power, the voltage drops. Nonzero high-frequency impedance occurs when a load demands a large amount of current, then stops demanding it suddenly, there will be a dip or spike in the voltage due to the inductances in the power supply line. Variations in the wave shape – usually described as harmonics. The oscillation of voltage and current ideally follows the form of a sine or cosine function, however it can alter due to imperfections in the generators or loads. Typically, generators cause voltage distortions and loads cause current distortions. These distortions occur as oscillations more rapid than the nominal frequency, and are referred to as harmonics. The relative contribution of harmonics to the distortion of the ideal waveform is called total harmonic distortion (THD). Low harmonic content in a waveform is ideal because harmonics can cause vibrations, buzzing, equipment distortions, and losses and overheating in transformers. Each of these power quality problems has a different cause. Some problems are a result of the shared infrastructure. For example, a fault on the network may cause a dip that will affect some customers; the higher the level of the fault, the greater the number affected. A problem on one customer’s site may cause a transient that affects all other customers on the same subsystem. Problems, such as harmonics, arise within the customer’s own installation and may propagate onto the network and affect other customers. Harmonic problems can be dealt with by a combination of good design and practice and well proven reduction equipment. What is Power Factor and its relationship with Power Quality? To understand Power Factor we need to first understand some definitions. KW is working power. Also called Actual Power or Real Power. KVAR – is reactive power. Power Factor is the ratio of Working Power to Apparent Power. To get to the beer you need to get through the foam, The more foam, (or KVAR) the lower your ratio of beer (KW) Therefore the lower your power factor. 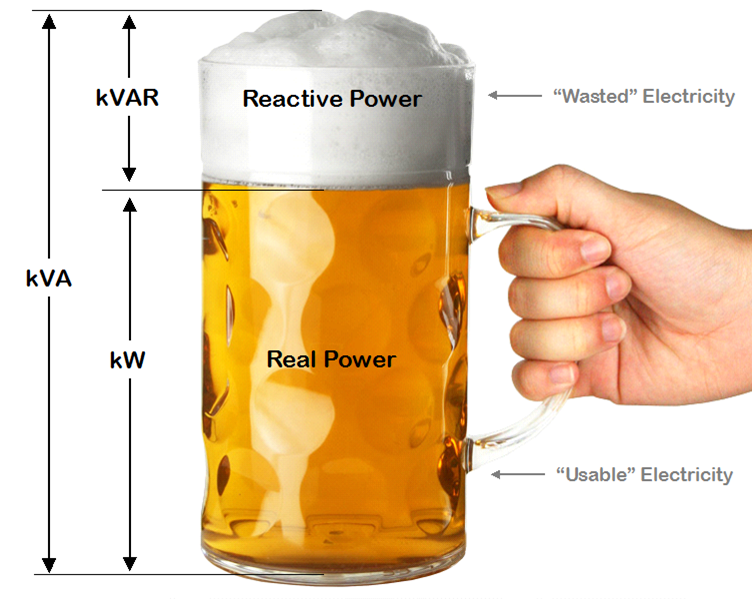 The less foam (KVAR) you have and the more Beer (KW) you have the higher your Power Factor. As the foam approaches zero so your Power Factor approaches one. Which is ideal. For the true power factor to be calculated the vectorial summation needs to be calculated. Which takes into account the angle and direction. Causes of low Power Factor is by INDUCTIVE loads. Transformers, Induction Motors, High Intensity Discharge Lighting. These play a major portion in the power consumed in industrial complexes. Now the power supplier supplies you in KVA (The whole glass of beer, beer and foam) The more foam you have (reactive power) the more the grid has to supply. So by raising your power factor to as close to one the more KW or Real Power you are using, and so you save on your energy bill. Harmonics and the impact on Power Quality! Harmonic voltages and currents in an electric power system are a result of non-linear electric loads. Harmonic frequencies in the power grid are a frequent cause of power quality problems. Harmonics in power systems result in increased heating in the equipment and conductors, misfiring in variable speed drives, and torque pulsations in motors (as the harmonic is trying to the motor to turn in the other direction) Reduction of harmonics is therefore a critical element to address. In a normal alternating current power system, the current varies sinusoidally at a specific frequency, 50 hertz. When a linear electrical load is connected to the system, it draws a sinusoidal current at the same frequency as the voltage. Current harmonics are caused by NON LINEAR LOADS. When a non-linear load, such as a rectifier is connected to the system, it draws a current that is not necessarily sinusoidal. The current waveform can become quite complex, depending on the type of load and its interaction with other components of the system. Further examples of non-linear loads include common office equipment such as computers and printers, UPS’s, Fluorescent lighting, battery chargers and variable-speed drives. Voltage harmonics are mostly caused by current harmonics. The voltage provided by the voltage source will be distorted by current harmonics due to source impedance. If the source impedance of the voltage source is small, current harmonics will cause only small voltage harmonics. Total harmonic distortion, or THD is a common measurement of the level of harmonic distortion present in power systems. THD can be related to either current harmonics or voltage harmonics, and it is defined as the ratio of total harmonics to the value at fundamental frequency times 100%. It must be noted that harmonics can increase in the evening after premises are closed, due to a sudden decrease in power demand. 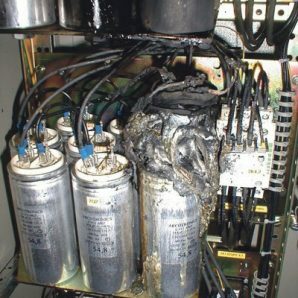 This leads to overheating and equipment left connected and can result in fires. It is becoming critical that consumers understand the quality of their power, as the potential losses in increased electricity bills, component failure, equipment failure, overheating and fires are increasing due to poor power quality. 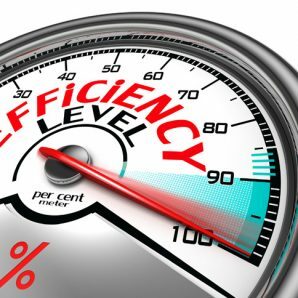 Factory owners will spend millions on installing state of the art equipment, but do not invest in understanding the one things that will make that equipment work, the power. Traditionally Power Quality analysis reads every 30 minutes, and the parameters being tested for need to be set beforehand. 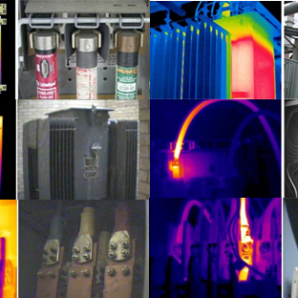 MRC Energy power quality analysis reads every minute, or even real time monitoring and does not need to be told what to test for, as full analysis can be undertaken of all data after the test is complete. 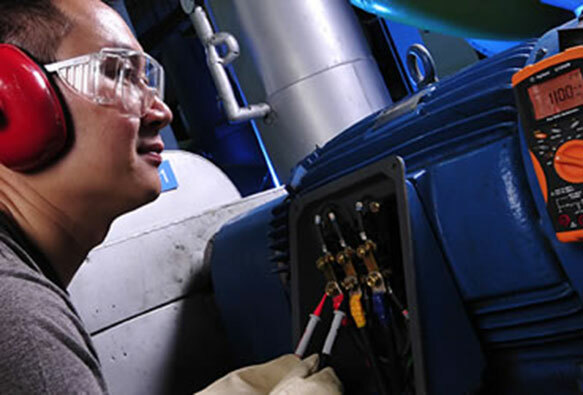 The power quality assessment we undertake will determine if the problems are caused by the power supplied or internal issues, or even a combination of both. Long term poor quality power will destroy your infrastructure and will continue to cause frequent breakdowns, increase your energy consumption and decrease the operational life of your equipment. MRC Energy assesses your power quality and minimises its impact by installing harmonic filters and power factor correction equipment.